For other uses, see Beelzebub (disambiguation). "Baalzebub" redirects here. For the spider genus, see Ray spider. Beelzebub or Beel-Zebub (/biːˈɛlzᵻbʌb/ bee-EL-zə-bub or /ˈbiːlzᵻbʌb/ BEEL-zə-bub; Hebrew: בַּעַל זְבוּב‎‎, Baʿal Zəvûv; Arabic: بعل الذباب‎‎, Ba‘al adh-dhabâb) is a name of a demon. 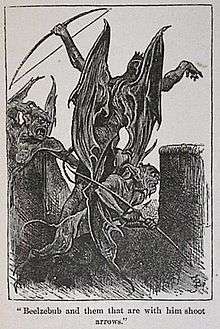 In Christian and Biblical sources, Beelzebub is another name for the devil, similar to Satan. In Christian demonology, he is one of the seven princes of Hell according to Catholic views on Hell. 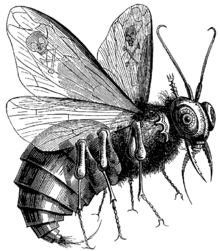 The Dictionnaire Infernal describes Beelzebub as a demonic fly who is also known as the "Lord of the Flies". The god of the Philistine city of Ekron, a Canaanite god. The source for the name Beelzebub is in 2 Kings 1:2-3, 6, 16. Ba‘al Zəbûb is variously understood to mean "lord of the flies" or "lord of the (heavenly) dwelling". Originally the name of a Philistine god, Ba'al, meaning "Lord" in Ugaritic, was used in conjunction with a descriptive name of a specific god. The Septuagint renders the name as Baalzebub (βααλζεβούβ) and as Baal muian (βααλ μυιαν, "Baal of flies"), but Symmachus the Ebionite may have reflected a tradition of its offensive ancient name when he rendered it as Beelzeboul. In regard to the god of Ekron, the belief that zebub may be the original affix to Baal and that it is a substitute for an original zbl which, after the discoveries of Ras Shamra, has been connected with the title of "prince", frequently attributed to Baal in mythological texts. Ba'al Zebub was used in Hebrew as a pun with Ba'al Zebul, where Zebul meant "of the manor," and in a derogatory manner Ba'al Zebub was used to offend the enemies of the Israelites. In addition to this last position, which is not supported by the versions, is the fact that it was long ago suggested that there was a relationship between the Philistine god, and cults of flies - referring to a view of them as pests, feasting on excrement - appearing in the Hellenic world, such as Zeus Apomyios or Myiagros. It is exactly this last connection which is confirmed by the Ugaritic text when we examine how Baal affects the expulsion of the flies which are the patient's sickness. According to Francesco Saracino (1982) this series of elements may be inconclusive as evidence, but the fact that in relationship to Baal Zebub, the two constituent terms are here linked, joined by a function (ndy) that is typical of some divinities attested in the Mediterranean world, is a strong argument in favor of the authenticity of the name of the god of Ekron, and of his possible therapeutic activities, which are implicit in 2 Kings 1:2-3, etc. Belzebuth şi naşul săŭ ("Beelzebub and His Nemesis"), cartoon published on the cover of Furnica magazine. On the right, as Beelzebub, carrying a folder marked Finance Ministry, is a defiant Take Ionescu, newly appointed by a Conservative government. His opponent (and predecessor by proxy) is the Liberal chairman Dimitrie Sturdza, who opposes budgetary reform. Petrescu-Găină depicts him as a Christian missionary figure, cross in hand, ready to confront the devil. It is unknown whether Symmachus was correct in identifying these names, because we otherwise know nothing about either of them. Zeboul might derive from a slurred pronunciation of zebûb; from zebel, a word used to mean "dung" in the Targums; or from Hebrew zebûl found in 1 Kings 8:13 in the phrase bêt-zebûl, "lofty house". Beelzebub is also identified in the New Testament as the devil, "prince of the demons". Biblical scholar Thomas Kelly Cheyne suggested that it might be a derogatory corruption of Ba‘al Zəbûl, "Lord of the High Place" (i.e., Heaven) or "High Lord". Texts of the Acts of Pilate (also known as the Gospel of Nicodemus) vary they use Beelzebul or Beelzebub. The name is used by Hades as a secondary name for the Devil, but it may vary with each translation of the text; other versions give the name Beelzebub as Beelzebub, but separates him from the devil. Beelzebub is commonly described as placed high in Hell's hierarchy. According to the stories of the 16th-century occultist Johann Weyer, Beelzebub led a successful revolt against the Devil, is the chief lieutenant of Lucifer, the Emperor of Hell, and presides over the Order of the Fly. Similarly, the 17th-century exorcist Sebastien Michaelis, in his Admirable History (1612), placed Beelzebub among the three most prominent fallen angels, the other two being Lucifer and Leviathan, whereas two 18th-century works identified an unholy trinity consisting of Beelzebub, Lucifer, and Astaroth. John Milton featured Beelzebub seemingly as the second-ranking of the many fallen cherubim in the epic poem Paradise Lost, first published in 1667. Milton wrote of Beelzebub, "than whom, Satan except, none higher sat." Beelzebub is also a character in John Bunyan's The Pilgrim's Progress, first published in 1678. 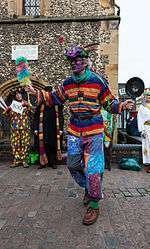 Within religious circles, the accusation of demon possession has been used as both an insult and an attempt to categorise unexplained behavior. Not only had the Pharisees disparagingly accused Jesus of using Beelzebub's demonic powers to heal people (Luke 11:14–26), but others have been labeled possessed for acts of an extreme nature. Down through history, Beelzebub has been held responsible for many cases of demon possession, such as that of Sister Madeleine de Demandolx de la Palud, Aix-en-Provence in 1611, whose relationship with Father Jean-Baptiste Gaufridi led not only to countless traumatic events at the hands of her inquisitors but also to the torture and execution of that "bewitcher of young nuns", Gaufridi himself. Beelzebub was also imagined to be sowing his influence in Salem, Massachusetts: his name came up repeatedly during the Salem witch trials, the last large-scale public expression of witch hysteria in North America or Europe, and afterwards, Rev. Cotton Mather wrote a pamphlet entitled Of Beelzebub and his Plot. Now Ahaziah fell through the lattice in his upper chamber that was in Samaria, and he became ill; and he sent messengers and said to them, "Go inquire of Baal-zebub, the god of Ekron, whether I will recover from this illness." But an angel of the Lord spoke to Elijah the Tishbite [saying], "Arise, go up toward the king of Samaria's messengers, and speak to them, [saying], 'Is it because there is no God in Israel, that you go to inquire of Baal-zebub the god of Ekron? Therefore, so has the Lord said, "From the bed upon which you have ascended you will not descend, for you shall die." ' " And Elijah went. Rabbinical literature commentary equates Baal Zebub of Ekron as lord of the "fly". The word Ba‘al Zebûb in rabbinical texts is a mockery of the Ba'al religion, which ancient Hebrews considered to be idol worship. Jewish scholars have interpreted the title of "Lord of Flies" as the Hebrew way of calling Ba'al a pile of dung and comparing Ba'al followers to flies. ↑ "1. According to 2 Kgs 1:2–6 the name of the Philistine god of Ekron was Lord of the Flies (Heb. ba‘al zeaûḇ), from whom Israel’s King Ahaziah requested an oracle. ", Balz, H. R., & Schneider, G. (1990-). Vol. 1: Exegetical dictionary of the New Testament (211). Grand Rapids, Mich.: Eerdmans. ↑ "The etymology of Beelzebul has proceeded in several directions. The variant reading Beelzebub (Syriac translators and Jerome) reflects a long-standing tradition of equating Beelzebul with the Philistine deity of the city of Ekron mentioned in 2 Kgs 1:2, 3, 6, 16. Baalzebub (Heb ba˓al zĕbûb) seems to mean "lord of flies" (HALAT, 250, but cf. LXXB baal muian theon akkarōn, "Baal-Fly, god of Akkaron"; Ant 9:2, 1 theon muian). ", Lewis, "Beelzebul", in Freedman, D. N. (1996). Vol. 1: The Anchor Yale Bible Dictionary (639). New York: Doubleday. ↑ "On the basis zebub, ‘flies’, the name of the god was interpreted as ‘Lord of the flies’; it was assumed that he was a god who could cause or cure diseases. ", Herrmann, "Baal Zebub", in Toorn, K. v. d., Becking, B., & Horst, P. W. v. d. (1999). Dictionary of deities and demons in the Bible DDD (2nd extensively rev. ed.) (154). Leiden; Boston; Grand Rapids, Mich.: Brill; Eerdmans. ↑ "It is not as probable that b‘l zbl, which can mean "lord of the (heavenly) dwelling" in Ugaritic, was changed to b‘l zbb to make the divine name an opprobrius epithet. The reading Beelzebul in Mt. 10:25 would then reflect the right form of the name, a wordplay on "master of the house" (Gk oikodespótēs). ", McIntosh, "Baal-Zebub", in Bromiley, G. W. (1988; 2002). Vol. 1: The International Standard Bible Encyclopedia, Revised (381). Wm. B. Eerdmans. ↑ "An alternative suggested by many is to connect zĕbûl with a noun meaning " (exalted) abode. "", Lewis, "Beelzebul", in Freedman, D. N. (1996). Vol. 1: The Anchor Yale Bible Dictionary (639). New York: Doubleday. ↑ "In contemporary Semitic speech it may have been understood as ‘the master of the house’; if so, this phrase could be used in a double sense in Mt. 10:25b. ", Bruce, "Baal-Zebub, Beelzebul", in Wood, D. R. W., & Marshall, I. H. (1996). New Bible dictionary (3rd ed.) (108). Leicester, England; Downers Grove, Ill.: InterVarsity Press. ↑ Saracino, Francesco. "Ras Ibn Hani 78/20 and Some Old Testament Connections". Vetus Testamentum. Vol. 32, Fasc. 3 (Jul., 1982), pp. 338-343. ↑ "In NT Gk. beelzeboul, beezeboul (Beelzebub in TR and AV) is the prince of the demons (Mt. 12:24, 27; Mk. 3:22; Lk. 11:15, 18f. ), identified with Satan (Mt. 12:26; Mk. 3:23, 26; Lk. 11:18). ", Bruce, "Baal-Zebub, Beelzebul", Wood, D. R. W., & Marshall, I. H. (1996). New Bible dictionary (3rd ed.) (108). Leicester, England; Downers Grove, Ill.: InterVarsity Press. ↑ "Besides, Matt 12:24; Mark 3:22; Luke 11:15 use the apposition ἄρχων τῶν δαιμονίων 'head of the →Demons'. ", Herrmann, "Baal Zebub", in Toorn, K. v. d., Becking, B., & Horst, P. W. v. d. (1999). Dictionary of deities and demons in the Bible DDD (2nd extensively rev. ed.) (154). Leiden; Boston; Grand Rapids, Mich.: Brill; Eerdmans. ↑ Rudwin, Maximilian (1970) . The Devil in Legend and Literature (2nd ed.). New York: AMS Press. p. 76. ISBN 0-404-05451-X. ↑ The Babylonian Talmud, Vol. 1 of 9: Tract Sabbath - Page 186 "made themselves Baal-berith for a god"; by Baal-berith is meant the Zebub (fly) idol of Ekron, and every idolater (at that time) made an image of his idol in miniature in order to keep it constantly at hand and to be able at any time to take it out, .."